Indian Prime Minister Narendra Modi on Friday said the shared resolve of Bangladesh and India against cruelty and terrorism will continue to inspire the future generations through Bangladesh Bhavan. 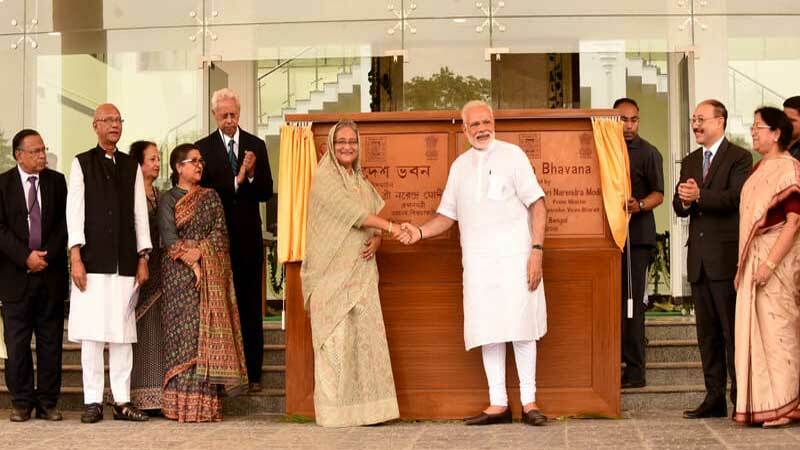 Speaking on the occasion of the inauguration of Bangladesh Bhavan, the Indian Prime Minister described it as a symbol of cultural ties between Bangladesh and India, reports the UNB. ‘Bangladesh and India are two nations, whose interests are linked to mutual cooperation and coordination among each other,’ Modi said. He said the last few years have marked a golden period in relations between the two countries and mentioned the resolution of the land boundary issue, and various connectivity projects. The Indian Prime Minister asserted that the two countries have similar goals, and are taking similar paths to achieve those goals. Earlier, Modi received Prime Minister Sheikh Hasina at Santiniketan. Paying homage to Rabindranath Tagore, the two leaders signed the visitors’ book. The two leaders then attended the Convocation of the Visva Bharati University. He said Bangabandhu Sheikh Mujibur Rehman is respected equally in both India and Bangladesh. Similarly, he added that Netaji Subhash Chandra Bose, Swami Vivekananda and Mahatma Gandhi are respected in Bangladesh as much as in India. In the same vein, he said Rabindranath Tagore belongs to Bangladesh, as much as to India. Speaking on the occasion, Modi described India’s democratic system of governance as a great teacher, which inspires over 125 crore people. He said it was his good fortune to be among the learned people on this sacred land of Rabindranath Tagore. Modi congratulated the students who received degrees and said that all those who studied at this University have not just received a degree but have also become inheritors of a great legacy. The Indian Prime Minister said the teachings of the Vedas, which describe the entire world as one nest, or one home, are reflected on the values of Visva Bharati University. He said Rabindranath Tagore is respected widely across the world and recalled that he had the opportunity to unveil a statue of Rabindranath Tagore in Tajikistan three years ago. Modi said Tagore is a subject of study in universities across the world even today. He described Gurudev as a global citizen. The Indian Prime Minister said Rabindranath Tagore always wanted Indian students to keep abreast of developments across the world, even as they kept their Indianness intact. He appreciated Visva Bharati University for its efforts at skill development and education in nearby villages. Modi encouraged the university to expand this effort to 100 villages by its centenary year in 2021. He also called upon the university to work towards overall development of these 100 villages. Modi said institutions such as Visva Bharati University have a key role to play in the creation of a New India by 2022. He outlined initiatives taken by the Union Government in the education sector. The Indian Prime Minister said this university and this sacred land have a history that has seen the freedom struggles of both India and Bangladesh. He added that it is a symbol of the shared heritage of the two countries.